Specifically designed with injection of inhibitors, such as MEG or Methanol in mind. 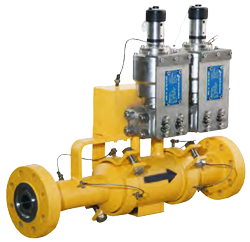 The Loflo is capable of measuring extremely low flow rates with a very high flow turn down. The Seastream LoFlo meters are designed to offer high accuracy and reliable operation, even in the harshest of subsea environments. These meters are designed to operate over a wide turndown. Each meter is designed for unique project applications and supplied in a variety of materials to suit individual Operator Specifications. Using the Digital technology within the SST sensors, the Loflo meter is uniquely capable of extending the flow measurement range to cope with inhibitor flooding during well start up. The introduction of the new in-head flow calculator removes uncertainty from integration into subsea systems while reducing client software programming time. The ability to include a flow calibration curve within the calculation can further enhance the accuracy of the Seastream. Close Coupled Diaphragm Seal Technology transferring the measurement closer to the process, is available for gas applications, reducing the possibilities of hydrate formation.